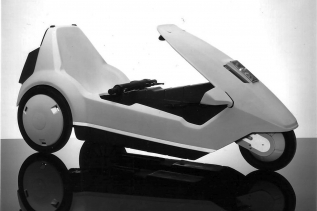 The ill-conceived C5 (coined as "the vehicle of the future") was a bit of a disaster for its inventor Sir Clive Sinclair. Indeed, it was one of Britain's biggest motoring failures. Launched on January 10th 1985, the battery-powered Sinclair C5 could be driven without a driving licence, as it's top-speed was under 15 mph. Despite being sold for just £399, due to much ridicule by the press, only 12,000 vehicles were ever sold. Our first video clip features Adrian Bennett driving a jet-powered C5. This amusing clip features a complete lunatic taking a trip back into the 80s in his jet-powered C5! Despite its commercial failure, the C5 has become a cult collector's item and there are many enthusiasts around the globe.